Stop oil palm expansion on Palawan’s UNESCO Man and Biosphere Reserve. 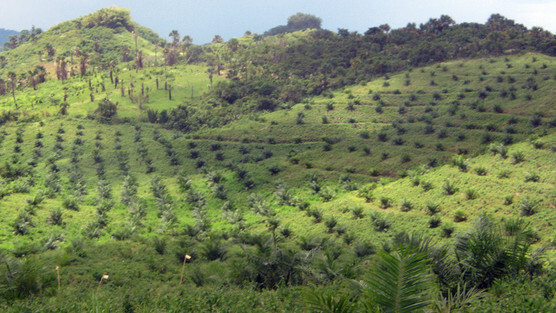 According to the Provincial government, oil palm monocultures will eradicate poverty and reduce economic dependence from imported edible oils. But, from the perspective of the local indigenous people, oil palm expansion is a tragedy since it destroys their ancestral lands and forest products, thus impoverishing them to an unprecedented level. Each day oil palm expansion brings havoc to the lives of Palawan indigenous communities. It also dramatically decreases local biodiversity and surrounding ecosystems. Few places in Southeast Asia can match the distinction of Palawan, in the Philippines. This is home to seven protected areas, a declared “Game Refuge and Bird Sanctuary” since 1967 and a “Mangrove Reserve” since 1981. UNESCO declared the whole Province a ‘Man and Biosphere Reserve’ in 1990. Today, in addition to the adverse impact of nickel mining, the local indigenous peoples and lowland farmers are being confronted with the threats posed by oil palm development. The bulk of oil palm operations are being carried out by the Palawan Palm & Vegetable Oil Mills Inc. and its sister company Agumil Philippines Inc. Both companies have been established through joint ventures between Filipino, Singaporean and Malaysian investors. As of now, about 15,000 hectares of land are being converted into oil palm plantations.According to the Provincial government, oil palm monocultures will eradicate poverty and reduce economic dependence from imported edible oils. But, from the perspective of the local indigenous people, oil palm expansion is a tragedy since it destroys their ancestral lands and forest products, thus impoverishing them to an unprecedented level. In Mindanao human rights violations include strafing, illegal arrest and holding farmers at gunpoint while personnel of the American oil palm firm A. Brown Company, Inc destroyed their crops. On October 2012, the escalation of violence towards the opponents of oil palm projects has led to the extra-judicial killing of Gilbert Paborada, an indigenous Higaonon activist. Both the Consortium and ALDAW believe what is happening in both Palawan and Mindanao totally bypasses people’s right to Free, Prior and Informed Consent (FPIC). However they are encouraged that in Palawan Indigenous Peoples are already organizing themsleves and several notarized affidavits against oil palm expansion have already been filed. Send a letter: either as an individual, or your organization, write a separate letter (suggested text here) and send to these postal addresses of the politicians listed. Two years ago DG. Bokowa wrote a personal letter to the Philippine representative for UNESCO. In your email to DG Bowoka, please express your concern regarding why UNESCO is not taking any action to protect and monitor what is happening within its Palawan declared UNESCO Man & Biosphere Reserve. See our previous alert on this issue.